Sterling silver Forehead Chakra charm bead with sapphire colored stone. 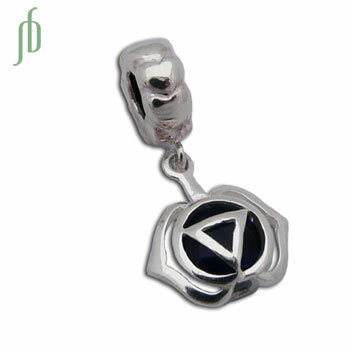 The third-eye chakra bead represents intuition, wisdom and insight. The opening of the bead is about 4.5 mm. The bead has hearts shapes around it and is equipped with a rubber stopper so it doesn't move around. The rubber stopper can be removed if you prefer it to move.